My health kick continues to go well. As well as feeling so much better in myself, I’m thrilled to report that I’m finally back to my pre-children weight and dress-size – my oldest is nearly 10, so it’s been some time coming. This feeling is really rather addictive and I can see how the changes I’m making to my lifestyle and eating habits will stay with me for the long-term. In addition to doing the 5:2 diet and generally eating more healthily, I’ve also set myself targets of walking 10,000 steps a day, getting a good night’s sleep every night (I’m aiming for at least seven hours), and fitting in a short workout most days (even if it’s only 10 minutes of Pilates or cross-training), plus a least one run a week. And I am really feeling the benefits. I have so much more energy, my brain feels more focussed and productive, my clothes fit well (the muffin top has been banished!) and I just feel good in my own skin. I’m trying to make as many fresh juices as possible, the perfect way to start weekend mornings, and love experimenting with different combinations of fruits and vegetables. This is one of my favourites. 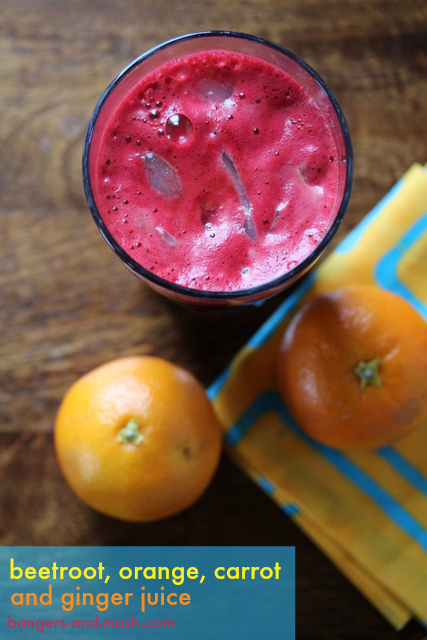 Featuring beetroot, oranges, carrot and fresh ginger, it looks as good as it tastes – full of vibrant, zingy flavour to boost the senses and wake-up the taste buds. 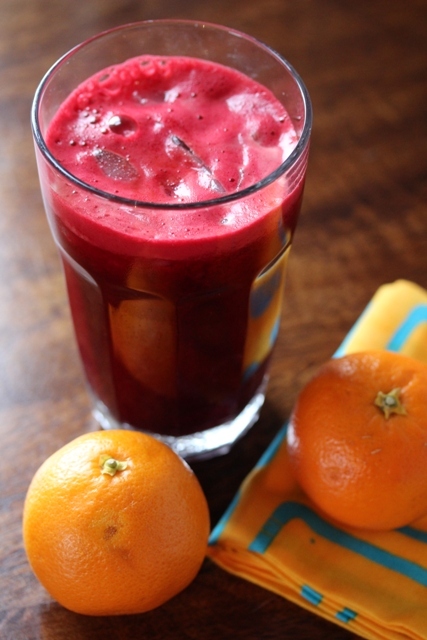 Simply chop up the beetroot, carrot and ginger and break up the oranges into segments and pass them through your juicer. Pour into glasses over plenty of ice and slurp happily. What are your favourite fruit and vegetable combinations for fresh juice? I’d love to hear your suggestions! 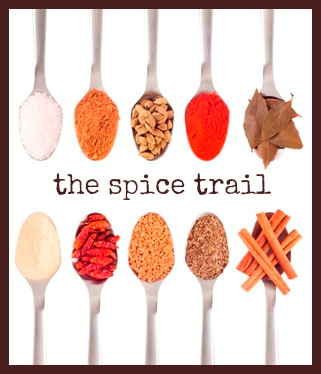 As this juice is 100% virtuous, I’m entering it in the current Spice Trail challenge as the theme is Temple Food. While fresh ginger isn’t technically a spice, I’m going to allow it. Well, I am hosting the challenge, so that’s my prerogative! Great juice Ness and well done on the new goals and fitness regime. We must catch up and this summer for a juice and a jog. I never tried beetroot juice but I bet it tastes great, especially mixed with those other ingredients you used.